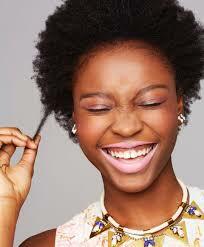 Some of you would have realized that natural hair is increasingly making its way back. In times past, natural hair was seen on very few people. But recently its popularity has increased. I decided to join #Team Natural not because it’s the reigning thing, but as an experiment, my front edges have disappeared (I wonder where they went to). Anyway since I don’t have the heart to do a big chop, I decided to transition; especially as I’m not sure of the future of the hair. What if I cut it and I later decide to go back to relaxed hair, what will I do? So still transitioning and watching, maybe my edges will find their way back. I’ve being transitioning for like 10 months now, and it’s not the easiest thing. A few days back when I loosened the braids I had, omosee hair. My hair is now almost completely natural; it’s just the tips that are still artificial. Before I combed the hair, I sprayed water in it, to make it easier to comb. Managing transitioning hair is very difficult. My hair was so dirty from all the Lagos heat and dirt, so I knew it needed serious washing. Unfortunately for me, my sister was not around. She’s the one who helps me wash and condition the hair. In fact, her help makes it easier to manage it. It was that day I saw what naturalistas always complain about; shrinking. My hair shrank big time; at first, it was funny. After washing the hair na, I couldn’t comb it. It was terrible. Not only had the hair shrank, the relaxed part had formed knots. The knots were so tight; I had to start cutting them away. As combing it was pretty difficult, I had to rub in shea butter, only then could I comb the hair. When my mother saw my hair, she was like, “your hair looks like dada” (dreads), lol. But it was true. I managed to comb it, tie it in a satin scarf and went to bed. By the time I woke up, the hair was very hard. As I got to the salon, I told the girl braiding it, before you part it, spray with water first. That’s a magic I learned, spraying your hair with water makes it easier to comb. I have a special spray bottle for that, in it are water, leave in conditioner and hair repair. Anyway, I was able to successfully braid the hair after wincing for the most part. If you see the finished product now, you would think I am lying on the hair. Most beautiful braids I have ever done (sorry you can’t see it). Do you have any natural hair tips for yours truly? If you do kindly share; especially for this transitioning period. lol I can just imagine the pain eh. I have told myself the truth that even if the whole world is transitioning I can not oh. My sister I don't just have the grace for that kian struggle eh. Hahahaha. Natural hair is truly a struggle.